This two-day Special Education Law & Advocacy Boot Camp, a Wrightslaw training program with Pete Wright and Pam Wright, is being sponsored by the Southern Arizona Network for Down Syndrome and the Autism Society of Southern Arizona. Download and share the brochure. Registration fee includes continental breakfast, lunch, and break time snacks for both days, a deluxe Wrightslaw highlighter pen and three Wrightslaw books, which retail for $62.85 - Wrightslaw: Special Education Law, 2nd Edition, Wrightslaw: From Emotions to Advocacy, 2nd Edition and Wrightslaw: All About IEPs. Credits: 1.2 CEUs (continuing education units) have been approved for this conference. There is additional fee of $48. CEU's are provided by the University of Missouri-Kansas City School of Education. They provide both graduate credit for practicing teachers and CEU's for a variety of professionals who need to document their professional development hours. A certificate of attendance will be available for attorneys for CLE submission. Reasonable Accommodations: Translation services or menu items contact the Autism Society of Southern Arizona no later than July 25, 2016. Scholarships: Contact The Autism Society of Southern Arizona for details. Refunds: No refunds after 5:00 p.m. July 25, 2016. A fee of $25 will be deducted from the refund. Wrightslaw programs often fill up early - don't miss out! 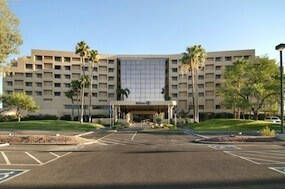 Click here for directions to the Hilton Tucson East Hotel. Note: The typical minimum charge for taxi runs from the airport: Super Shuttle $35, Taxi $40. The Hilton East is offering a discounted room rate of $63 (plus tax per night) for conference participants. Follow the link below to book your room or call 1-800-445-8667 to receive the discount. Mention the group code of ASSA or Wrightslaw Special Education and Law Advocacy Conference. Reservations must be made and confirmed by July 25, 2016 to take advantage of this discounted group rate. After this date rooms will be available at regular rate. The hotel requires 48 hour notification prior to arrival on cancellation with no penalty. For more details, please click here. We built the Arizona Yellow Pages for Kids with Disabilities so people can get reliable information and support. The State Yellow Pages has many useful resources - evaluators, educational consultants, academic tutors, support groups, grassroots organizations, advocates, attorneys and others who help parents get services for their children. If you provide a service, sign up to be listed on the Yellow Pages for Kids with Disabilities - this is a free service from Wrightslaw.